If you own a dog, you've heard this rule: 1 year for Fido equals 7 years for you. Turns out, the math isn't that simple. Dogs mature more quickly than we do early on. So the first year of your fuzzy friend’s life is equal to about 15 human years. Size and breed also play a role. Smaller dogs tend to live longer than larger ones, but they may mature more quickly in the first few years of life. A huge pup might age more slowly at first, but be nearing middle age at 5. Tiny and toy breeds don't become "seniors" until around age 10. Medium-sized pooches are somewhere in the middle on both counts. If you’ve adopted a puppy or dog but don't know her history, you may not know how old she is. Even if you don’t know the birth date, you can still guess her age. Her teeth should give you a rough idea of her age. These guidelines will vary from dog to dog, and they also depend on the kind of dental care (if any) she had before you got her. Your vet can also guess her age based on a complete physical exam or tests that look at bones, joints, muscles, and internal organs. Senior dogs might show some specific signs of aging. Gray hair. It starts around the muzzle then spreads to other areas of the face, head, and body. AVMA: "Frequently Asked Questions about caring for an older pet." Purina: "Your Dog's Age in Human Years," "Caring For Your Older Dog." 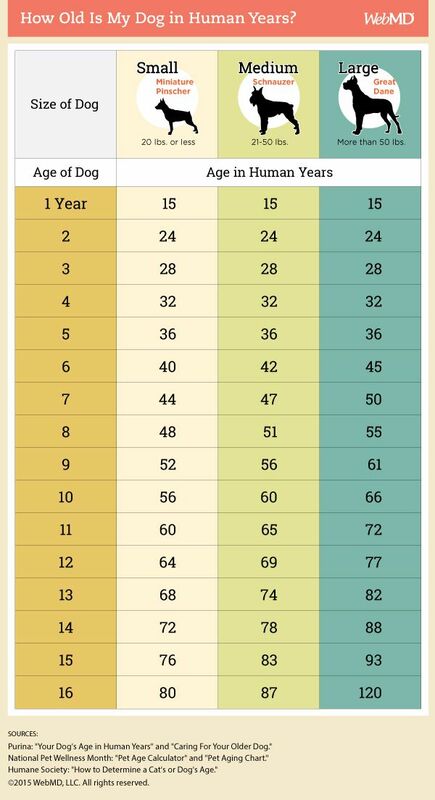 National Pet Wellness Month: "Pet Age Calculator," "Pet Aging Chart." Humane Society: "How to Determine a Cat's or Dog's Age."